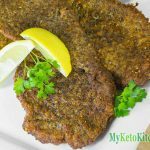 The perfect Low Carb Beef Schnitzel requires thinly sliced meat if you can't get your meat thinly sliced then grab a meat mallet. Place your steak between two pieces of parchment paper and beat the steak until it is between 5-8mm thin. Turn your deep fryer to 350F/180C and allow to heat before frying. Crack the egg into a bowl and add the heavy cream, whisk together. In a separate bowl mix together the parmesan cheese, ground flaxseed, garlic powder and pepper. Pour this mix onto a tray and flatten out. 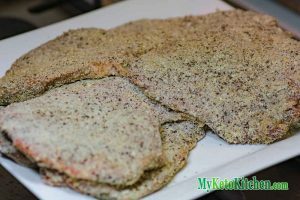 Dip each steak into the egg mix, then press into the parmesan mix, press the "breading" onto each side. Begin frying your schnitzels. Each schnitzel will take around 5-7 minutes to cook, ensure that the entire schnitzel is immersed in the oil for even cooking. If your have a small fryer it is a good idea to fry them in small batches, one or two at a time. Serve your schnitzels with a squeeze of lemon juice.